The Tamilnadu Dr. MGR Medical University will provide 30 credit points for the participation of the course. This course provides thorough knowledge in the principles and practice of clinical trials to study the effect of an intervention on health outcomes. This will include lectures, practicals, participant’s presentation, and group work. To impart the basic concepts in Ethical issues in research, Journal critique and in Systematic reviews. 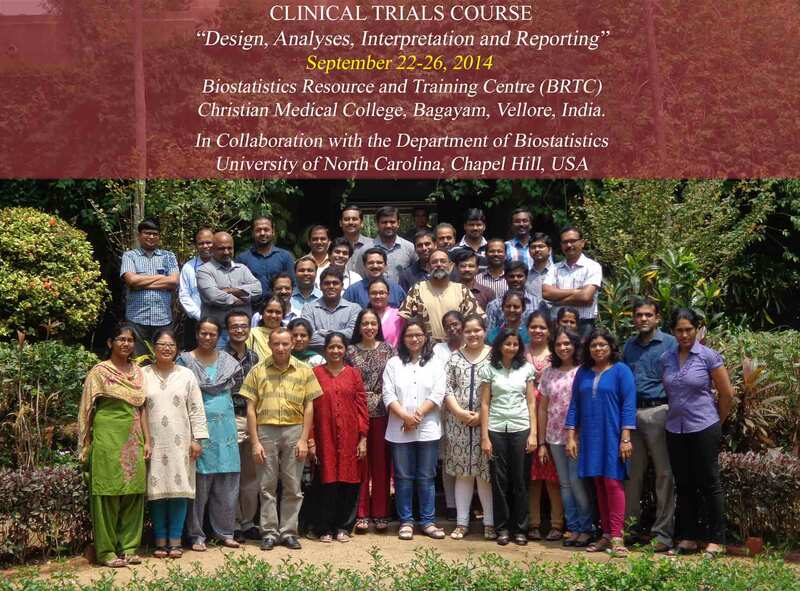 To discuss and clarify the methodological challenges in the planning, conduct and analyses of a trial. To impart the basic skills necessary in monitoring the trial and to develop a quality data management system. This course is tailored to researchers working in Pharmaceutical Industries, medical, allied health professionals, nonmedical faculty and researchers actively involved in trials, or teaching or in furthering their knowledge and skills in methodology. Each participant will be randomly allocated to a group and the group will be assigned a research question and given background materials to develop a protocol following GCP and CONSORT guidelines. Each group’s protocol development process will be facilitated by a mentor. Each group will be asked to present their protocol orally to the rest of the groups and faculty for discussion. Course Fee should be paid in full by September 13, 2014. Payment can be made by Demand Draft in favour of “Christian Medical College Vellore Association Account “, payable at Vellore. Course fees will not be refunded once the payment is done. Participants will have to bear their own expenses for travel, boarding and lodging. The Organizers will give lunch and snacks. No on-campus accommodation facility is possible. However, details of hotels in Vellore and their contact numbers is attached with this mail. Interested participants are requested to kindly contact the hotel of their choice from this list and make their own hotel bookings. The cost of the nMaster software is fixed for Rs.2500/- for Academic / Government institutions and Rs.5000/- for Commercial. However, those who would participate in this workshop from the Academic / Government institutions, a concession of Rs.1000/- will be offered to buy this nMaster software (price - Rs.1500/-). The number of participants: limited to 30 admissions will be purely on first come first served basis. - What does Phase I mean?